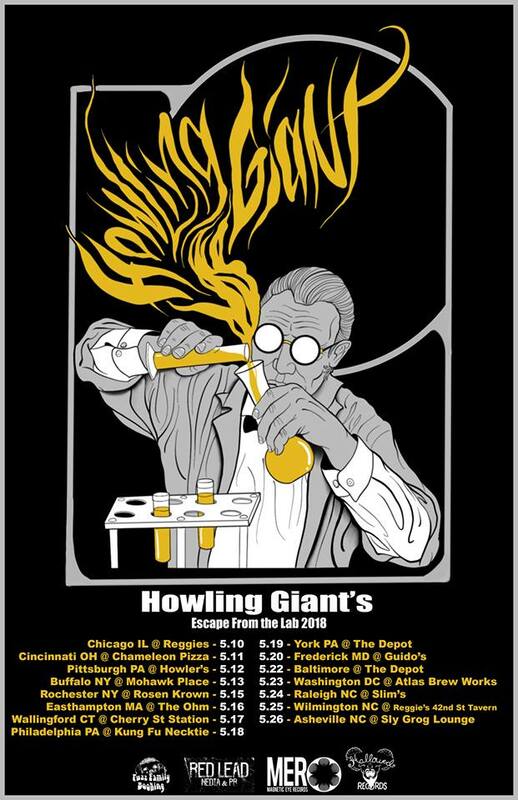 Starting this Thursday (the tenth of May) and then lasting for the next two-plus weeks, Nashvillian trio Howling Giant will be traipsing all over the eastern USA in what they’re calling their “Escape from the Lab” tour. We’ve got details down below, and on your way there we’ll be covering the first two portions of the band’s planned trilogy Black Hole Space Wizard. That way, once you get to the list of dates you’ll either be very excited if you find your city included or very disappointed if you find it omitted. Either way, though, you’ll be treated to some great music — which you’ll have the opportunity to download for as cheap as you’d like. Win-win! The first part of this story cycle is told in four segments (totalling about twenty-one minutes), including humanity reaching a point where it needs to vacate the planet, followed by an encounter with the Black Hole Space Wizard. For the most part, the plot is delivered in the form of lovely harmonic vocals accompanied by spacey psychedelic music and tons of distorted organ (plus the occasional snippets of dialogue, also related to similar science-fictiony themes as the lyrics). Belying the group’s country-music-hall-of-fame hometown, opening track (and first single) “Mothership” includes a touch of twang in the guitar part, sounding like some sort of southern-rock/stoner-psyche-spacerock hybrid. “Exodus Earth,” where the main action of the story begins, is built upon real slow overdriven riffs, and closing track “Clouds of Smoke” is likewise fairly mellow. An interesting change of pace, though, is the third song “Dirtmouth” which introduces our antagonist: the guitar part is much quicker here (almost like a blending of the intro to this song and this one. The drums and bass are also very fast-paced when they enter, the vocals here are harsher (more yelling, less harmonizing), and the whole thing is just heavier all around. Focusing on the lone survivor of the previous chapter, Part 2 (divided into six songs, clocking in at close to thirty-two minutes this time around) is the sound of exploration and adventuring. This ranges from the mellower and more atmospheric “Henry Tate” and “Visions”; to the much heavier and more expansive “Circle of Druids” and “Earth Wizard”; the minimal two-minute interlude “The Forst Speaks” which pairs a lightly-plucked acoustic with a sultry saxophone; and the stratospheric “The Pioneer” with its fuzzy bass and heavy organ/guitar interplay. That last title (actually the second track here) is a reference to the last remnant of humankind who was left behind to fend for himself on a deserted planet. Representing the various excursions and encounters, this record is filled with a wider variety of music, which tends to be more drawn-out and exploratory. Both of these releases are available to stream or download (for whatever price you’re willing to pay) via the Bandcamp players below, and both are also out on CD right here. Don’t forget to check out the tour dates listed below, and stay tuned for Black Hole Space Wizard: Part 3 coming soon to a pair of headphones near you! This entry was posted in Free Downloads, Pittsburgh, Reviews, Shows, Videos and tagged Holy Rivals, Howlers, Howling Giant, Mires, Nashville, Tennessee, USA. Bookmark the permalink.